Once again, the start of the month caught us off guard and instead of the beginning of the moth post, we are doing a mid-month post. Waterville, Kroger Customers, I would like to direct your attention to your cart! 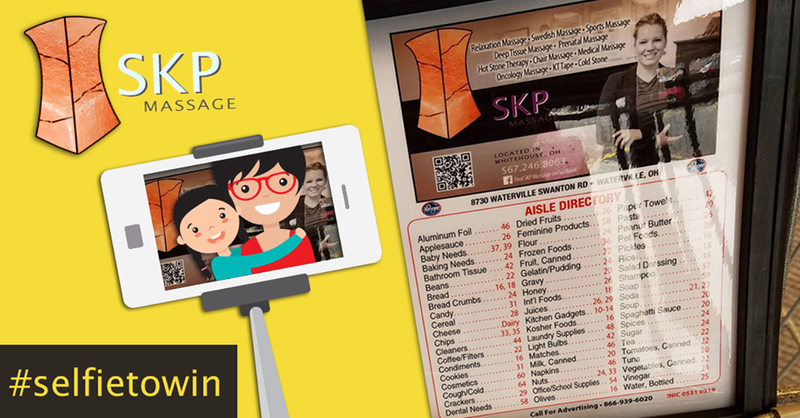 Have you seen the SKP Massage ad? This month we would like to see you post your selfie with out ad! Be Sure to tag @SKPMassage, and we will add an extra 10 minutes to your next session. Online gift cards are available. Follow the link on the website, or via Facebook.com/skpmassage. Be sure to tell your gift card recipient to save the email until after they use it and/or print that gift certificate number! As always gift cards are available in office. Please remember to stay cool this month and drink your water!